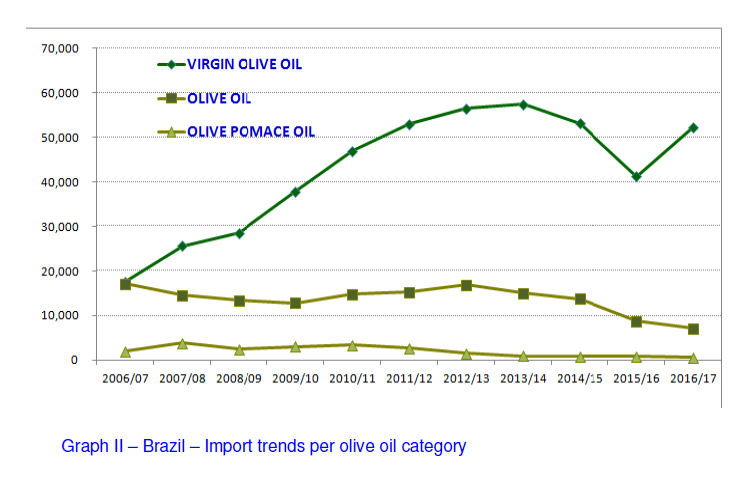 Imports in olive oil and olive pomace oil in the first ten months of this crop year (October 2016 – July 2017) in the eight markets in the table below point to an increase of 25% in Brazil; 20% in Australia; 10% in China; 8% in Russia; 1% in Canada, and stable figures in Japan. In the United States, however, imports decreased by 5% compared to the previous crop year. EU figures1 for the first nine months of the current crop year (October – June 2017) indicate that intra-EU acquisitions increased by 5% and extra-EU imports decreased by 6% compared to the same period the previous year. EU acquisitions increased by 1% while extra-EU imports increased by 5% compared to the previous crop year. After two historical years of imports where China purchased 46.000 tonnes during the 2011/2012 season, purchases dropped up to 35,000 tonnes for the biennium 2013/2015. The 2015/2016 period was a recovery period with an increase of 12% and purchases of more than 40,000 tonnes, while during the first seven months of the 2016/2017 season, the increase amounted to around 17%, which is a historic record of purchasers from overseas, according to figures from the International Olive Council (IOC). With the latest available data from the 2015/2016 period, Spain took up 80% of the sales with more than 32,100 tonnes, followed by Italy with 13% with a little more than 4,000 tonnes; Greece with 2%, around 800 tonnes and with a little more than 2.000 tonnes; and 5% shared between Australia, Tunisia, Morocco and Turkey, in that order. 77% of the sales correspond to extra virgin olive oil and virgin olive oil, followed by olive pomace oil by 14%, while the remaining 9% corresponds to refined olive oil. However, some of their highest surfaces such as Sichuan have mild temperatures during winter and more hours of sunshine, so cultivation of certain varieties such as Arbequina, Arbosana or Koreneiki, of international acceptance, are suitable for these areas. Harvests take place in September, two months in advance compared to the average of the northern hemisphere, which gives a certain competitive edge. Already in the Mao Zedong era, China encouraged the olive tree as a social cultivation, thanks to the exchange of experiences with other communist regime such as the Albania of Enver Hoxha’s time. Currently, there are nearly 70,000 hectares of olive trees and a production in the last season of 5,000 tonnes, similar to that of France or Cyprus that, according to projections, will exceed 6,000 tonnes during the following season. After destroying entire olive groves in Italy and last year appearing in the Balearic Islands, the first case of the destructive bacterium Xylella fastidiosa has been confirmed on mainland Spain, making farmers worry in the land where olive oil is liquid gold. “Clearly, we are not going to be able to stop this; it’s a question of time before it reaches us,” said Luis Carlos Valero, leader of the ASAJA farmers’ union in Jaén, after the plague was confirmed as having been detected in Alicante last week. The fact that the first affected plant on the mainland was an almond tree is no consolation for olive growers; more than 300 European plant species have proved to be susceptible to Xylella. In Italy around a million trees are reported to have been killed by ‘olive quick decline syndrome’ after being attacked by bacteria that can be carried by various common meadow insects. In Spain, which has 350 million trees and where half of the world’s olive oil is produced, industry representatives fear the impact could be catastrophic. 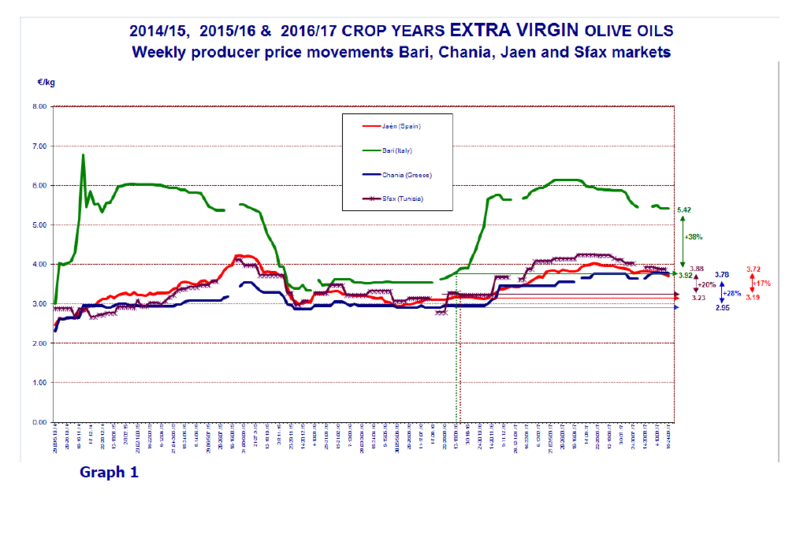 The olive oil market is immersed in a process of consolidation in Russia, where the two main competitors, Spain and Italy, jointly concentrate a growing share both in terms of value and volume. Nowadays, Spain dominates the Russian market with 56% of share, although the Italian oil has burst with great force in the last years, reaching a share of 30%, according to a study of ICEX España Exportación y Inversiones. El estudio destaca que en Rusia se consume principalmente aceite de girasol y el país ha aplicado políticas para reducir la dependencia del exterior de este producto con éxito y se ha convertido en unos de los principales productores a nivel mundial. “>The study highlights that in Russia sunflower oil is consumed mainly and the country has successfully implemented policies to reduce external dependence of this product and has become one of the main producers worldwide. Eight Spanish entities that bring together almost 80% of the Spanish organic sector have jointly signed a statement, addressed to the Minister of Agriculture, Food and Environment, Isabel García Tejerina, stating their disagreement with the draft of the new European Regulation on Organic Production and the Labeling of Organic Products. In this statement they request that the Minister should vote against the agreement to this document in the Special Committee of Agriculture so that it continues working in the deficiencies that the text presents. This seems the perfect timing because today there is a meeting between the Ministers of Agriculture of the member countries of the European Union to vote for or against the new draft of the Regulation of Organic Production and the Labeling of Organic Products. Based on the latest provisional data from the Food Information and Control Agency (AICA), we wanted to gather the opinion of several professionals, who have analyzed the evolution during this campaign of a unique market situation. The provisional data published by the AICA, facilitated by the Asociación Agraria de Jóvenes Agricultores (Asaja) of Jaén, detail that Spain has produced in the first five months of the campaign 1,230,000 tons, whereas in the specific case of Andalusia the accumulated figure is of 1,006,000 tons. The data regarding market outlets is high, with 136,500 tons in February, the second best monthly output so far this year and the second best outlet in the last five seasons. Meanwhile, total stocks at the end of February amounted up to 987,300 tons, which means 25,000 tons more than the previous month and 99,100 tons less than the previous season. The CEO of Luque Ecológico, Juan Manuel Luque, believes that this year can go down in history as showing the largest figure for Spanish sales of olive oil, since to the high prices we can add a crop that, although being lower than what some operators expectated, it is among the best ten in History. The Office of the United Nations in New York, the depositary of the International Agreement on Olive Oil and Table Olives, 2015, has just informed the Executive Secretariat of the International Olive Council that the Hashemite Kingdom of Jordan ratified said Agreement on 19 April 2017. Jordan, which signed the Agreement on 22 December 2016, is an important olive producing country. According to the data provided by its Ministry of Agriculture, approximately 80 000 Jordanian families are employed in the national olive sector. Olive trees occupy close to 72% of the total surface area given over to fruit trees and 36% of Jordan’s arable land. As an integral part of daily life and customs in Jordanian society, a considerable heritage has grown up around olive growing, being one of the country’s most important and oldest crops. Some 15 – 20% of the 17 million olive trees in Jordan were planted in Roman times and are thought to be up to 2 000 years old. At 19 April 2017, 13 countries had signed the International Agreement on Olive Oil and Table Olives, 2015, (Algeria, Argentina, Israel, the European Union, Jordan, Lebanon, Libya, Montenegro, Morocco, I.R. of Iran, Tunisia, Turkey and Uruguay). Four of these have notified their provisional application of the Agreement (Algeria, the European Union, Libya and Morocco). Three countries have ratified, accepted or approved it, or have acceded to it definitively (Jordan, Palestine and Tunisia). EVOOLEUM. World’s TOP 100 Extra Virgin Olive Oils is an international competition for the quality of extra virgin olive oils, which will select the 100 best EVOOs in the World. Thus, a group of expert tasters renowned worldwide will be in charge of conducting the valuation of the organoleptic quality of the juices presented, where there will be every season the exclusive TOP100 of the best extra virgins of the world, and the best on their different categories and geographic areas. The results of the EVOOLEUM Awards were unveiled yesterday at the World Olive Oil Exhibition (WOOE), which was held for two days at the fairgrounds of Ifema in Madrid. 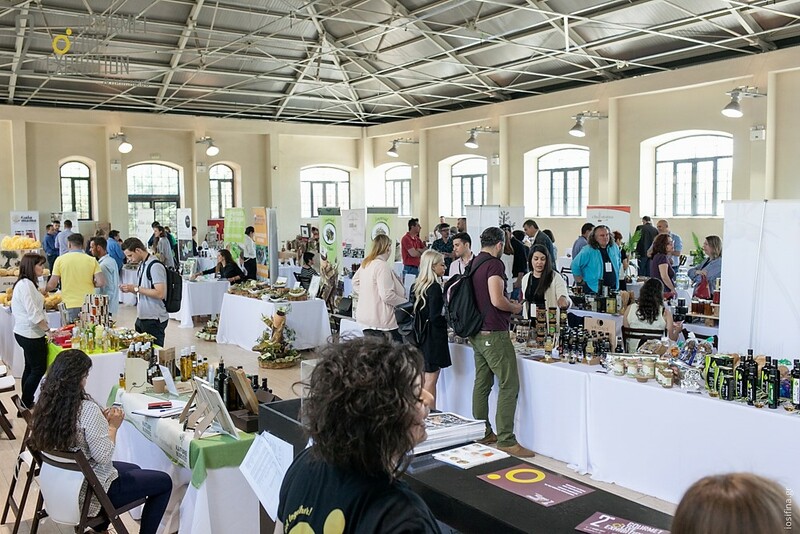 Organizers of the contest- presented the EVOOLEUM World’s TOP100 Extra Virgin Olive Oils Guide and unveiled the names of 100 brands of EVOO from 16 countries that the jury has considered the best in the world (above 80 points). 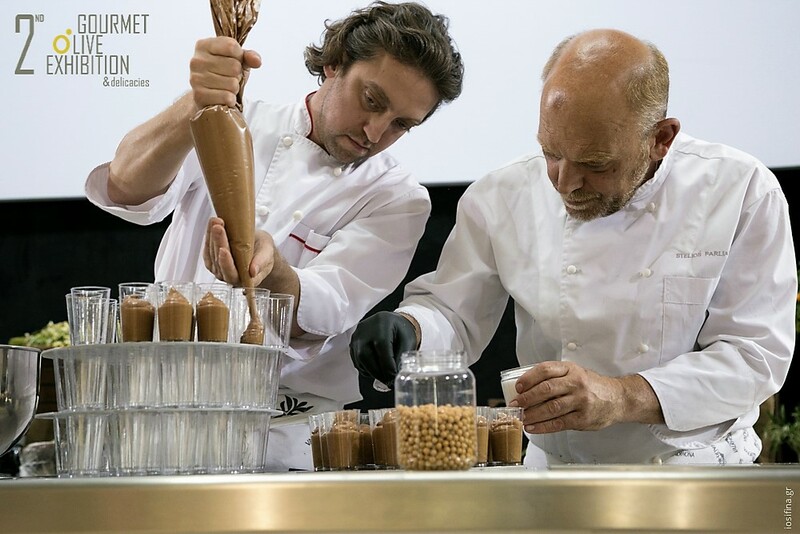 In the second edition of the contest, held on March 10 and 11 in Cordoba, a total of 22 internationally prestigious expert tasters from eight countries valued the more than 300 samples submitted to the competition. EVOOs from Spain, Italy, Portugal, Greece, France, Croatia, Slovenia, Turkey, Israel, Morocco, Chile, Jordan, Saudi Arabia, Germany, South Africa and Tunisia have competed in this second edition to form the ranking of the world’s TOP100 EVOOs that will be included in the EVOOLEUM World’s TOP100 Extra Virgin Olive Oils Guide 2017, published in English and Spanish, and of annual periodicity, that is distributed in the main contests and international fairs of the olive and gastronomic sector, as well as in gourmet and delicatessen establishments, Michelin-star restaurants, bookstores and supermarkets. OLIVE JAPAN 2017 pleased announce the Award Winners !! OLIVE JAPAN International Extra Virgin Olive Oil Competition is one of the premier olive oil competitions in the world, bringing together the highest standards of integrity and professionalism in awarding medals to the best oils from around the globe. 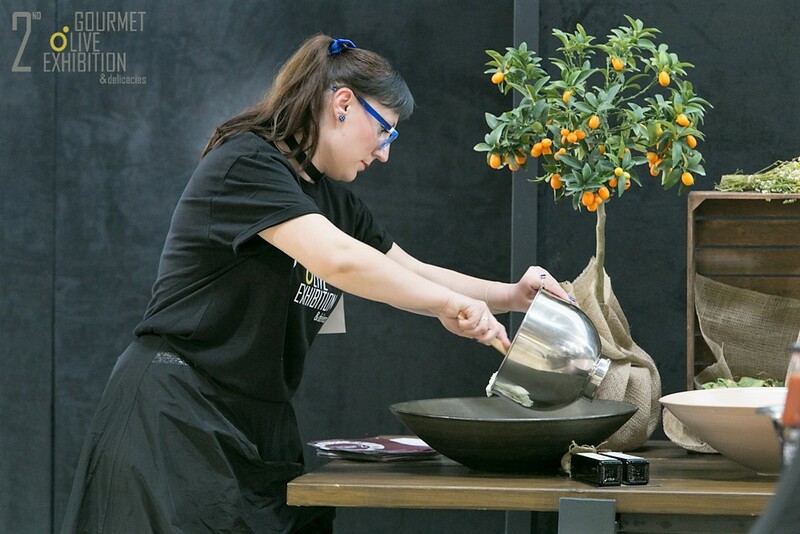 This Competition will be held as a key program in the “OLIVE JAPAN 2017” and winners will be prized at the main event of the MARCHE tradeshow, and will be carried by major papers and trade magazines. 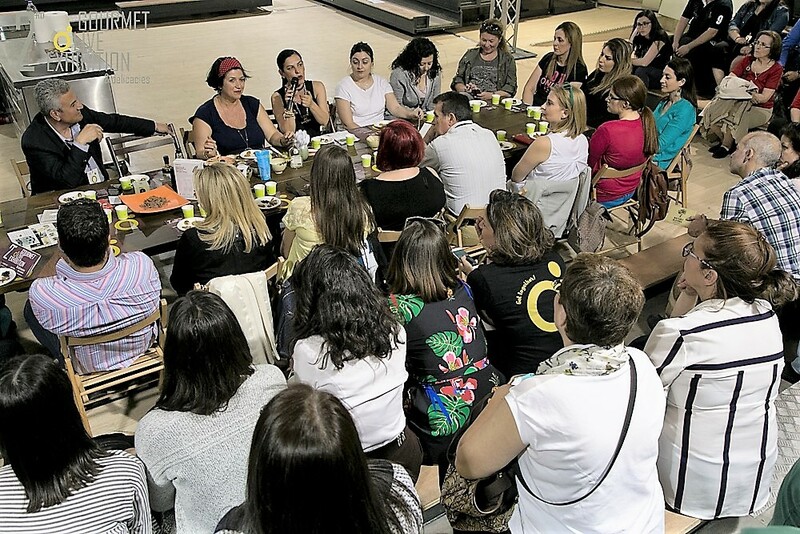 The competition is committed to educating the public about extra virgin olive oil, featuring industry experts with extensive knowledge about selection, tasting and food pairings. OLIVE JAPAN International Extra Virgin Olive Oil Competition and its panel of tasters invite you to participate in the sixth annual competition open to extra virgin olive oils and flavored olive oils throughout the world. In the 2016 Competition, OLIVE JAPAN had total 600 olive oil entered and 420 olive oil got awarded. The Competition Results was appeared on this website on April 24th, 2017. 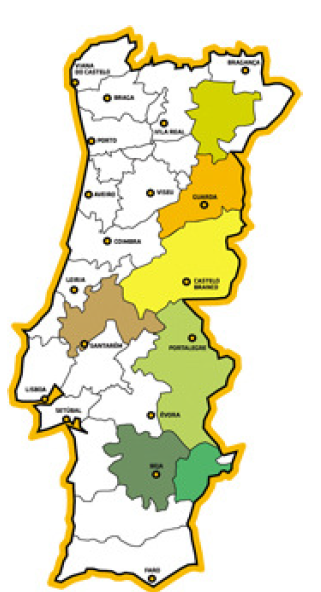 At the invitation of the Casa do Azeite, the Portuguese Olive Oil Association and the Portuguese authorities, the 49th meeting of the Advisory Committee will take place in Lisbon (Portugal) on 18 May 2017. Portugal is a founding Member of the IOC, since February 1956, and the first Agreement establishing the International Olive Council in 1959 at the initiative of a group of countries (Belgium, Spain, Greece, Israel, Italy, Libya, Morocco, Portugal, the United Kingdom and Tunisia). It has participated actively in all the international agreements on olive oil and table olives, as well as in the working groups set up to monitor the activities of the Organisation. On 1 January 1986, it joined the European Union and currently holds the status of a European Member State. The olive growing area in Portugal is of 352 000 ha, of which 23% is irrigated while the rest is rain-fed. The largest olive tree domains are found in the Alentejo region, which accounts for 50% of the total olive growing area, followed by Tras-os-Montes (22%), Centro (18%); Ribatejo (7.7 %) and Algarve( 2.3%). Close to 97.5% of the total surface area is used to grow olives for olive oil, while the rest is used for table olives. Six per cent of the olive growing area is used for organic olive farming. The main olive varieties are the Galega Vulgar, which is the most common variety in Portugal, and the Cobrançosa, which is indigenous to the Tras-os-Montes region, even though it is found throughout the country. The Carrasquenha variety is mainly cultivated in the area of Alentejo, together with the Cordovil de Serpa variety; Verdeal and Madural are two varieties grown in the Tras-os-Montes area; and Cordovil de Castelo Branco is gorwn in the Beira Interior region. The varieties Maçanilha Algarvia, Negrinha de Freixo (Tras-os-Montes ) and Conserva de Elvas are the main varieties used for table olives. It should be noted that since 2003/04 new areas have been planted in the Alentejo region, covering approximately 40% of the area, with varieties such as Arbequina, Arbosana, Koroneiki and Picual. 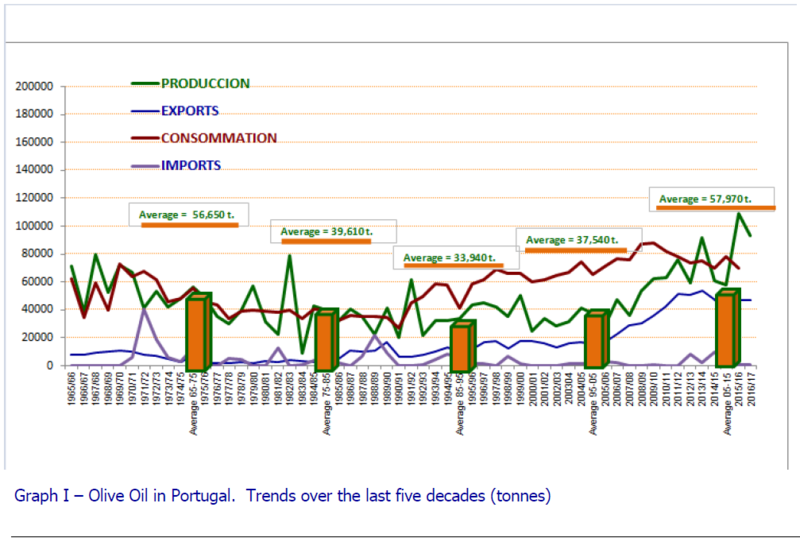 Olive growing is a significant agricultural activity in Portugal, generating €95.5 million and accounting for 1.36% of the value of agricultural production. The olive sector employs 1 431 people (1.6% of the agriculture and food industry total); it has more than 495 olive mills, 12 olive oil refineries and 17 olive pomace oil extractors. (rejuvenation pruning, irrigation) as well as an increase in the transformation capacity of the olive mills. 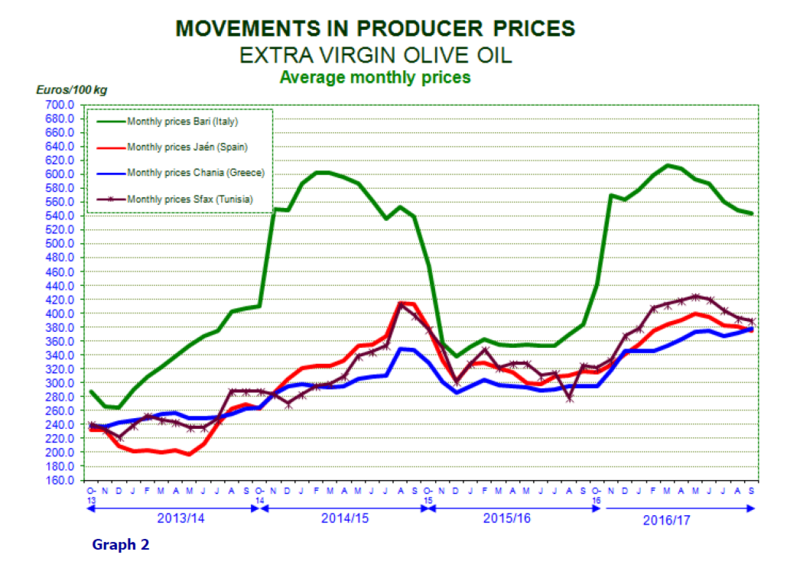 Graph 1 shows the trends in the last five decades, achieving an average production in the last decade 2005-15 of 57970 t. It achieved a production record in the 2015/16 crop year with 209 125 t, of which 78% of the production was extra virgin olive oil (85 285 t), 17% virgin olive oil (19 095 t) and 4% lampante virgin olive oil (4745 t). are mainly Spain, Italy and France. 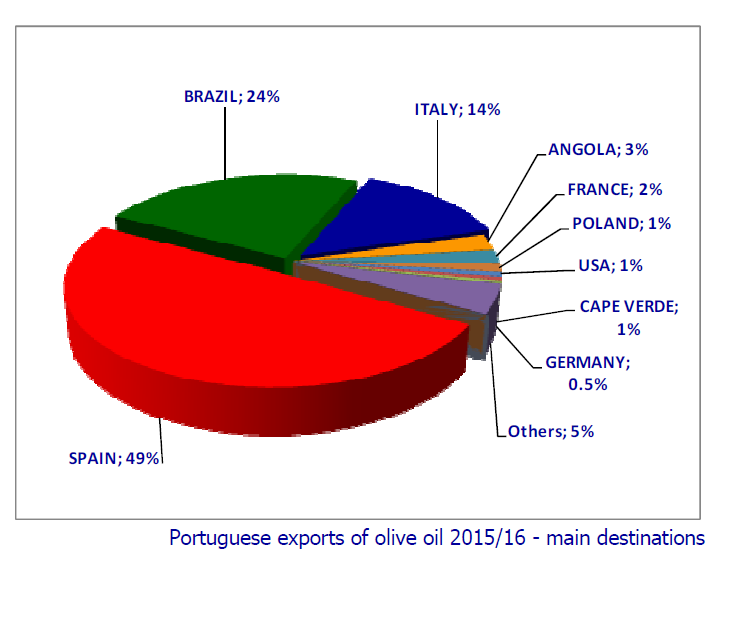 The main destination of extra-EU exports is Brazil with 24% of total exports, followed by Angola (3%). In terms of product category, 81% of total exports are virgin and extra virgin olive oil, 11% olive oil and 8% olive pomace oil. The first deadline to register for the next edition of the TerraOlivo Extra Virgin Olive Oil International Contest will end on March 31st. According to the statements the organizers of the event to Mercacei, those interested in participating will have a discount before this date, while from April 1st the registration period will continue until May 31st. Specifically, in the case of the registration before March 31st the cost for each sample will be of 220 euros (compared to the price of 250 euros of the standard registration); while the registration will be free in the case of the design prize (being 40 euros after March 31st). The organization has pointed out that so far it has beaten a record of foreign samples entered (302 EVOOs without including Israeli juices). “At TerraOlivo, more than 70% of the samples come from abroad, which makes it the most international competition”, they underlined. 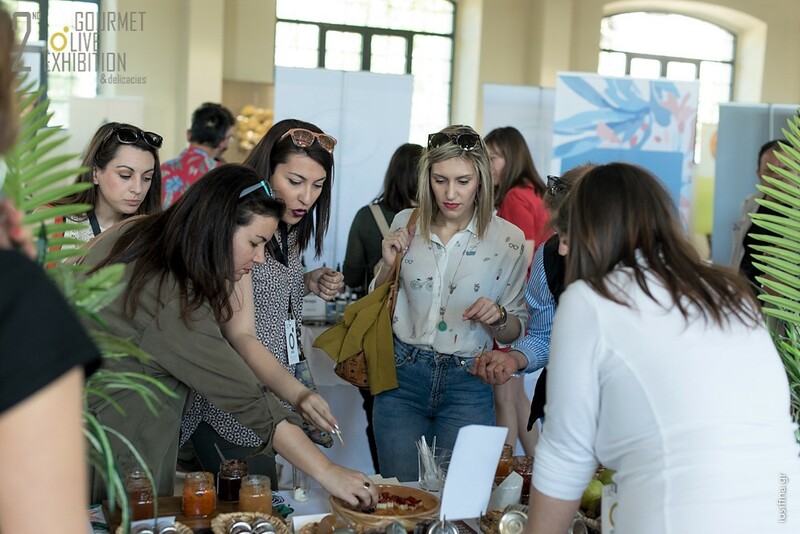 The founder and organizer of TerraOlivo, Moshé A. Spak, is confident on reaching the number of samples received the previous year which amounted to 608 juices and has remarked that the contest will have six commissions made up of expert collectors from around the world. 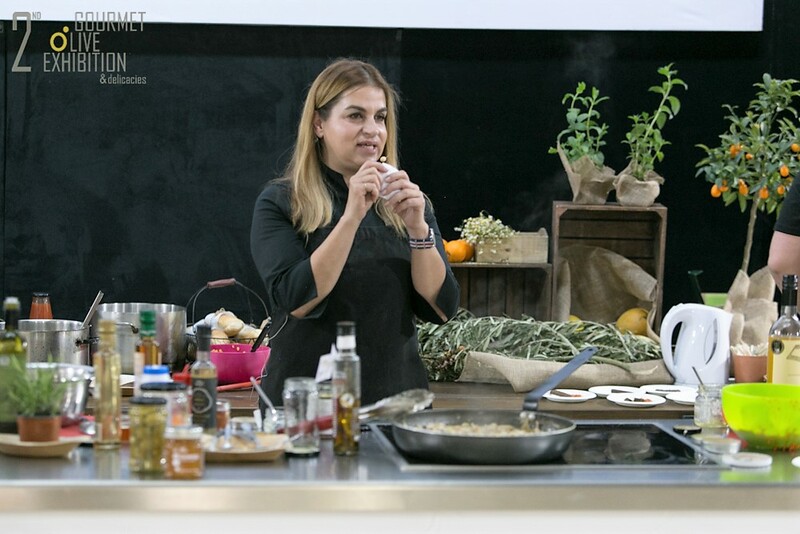 Among the objectives of these awards, held in June in Jerusalem, Spak highlights the promotion of the nutritional benefits of EVOO and its international market and consumption, as well as spreading the benefits of the Mediterranean Diet. 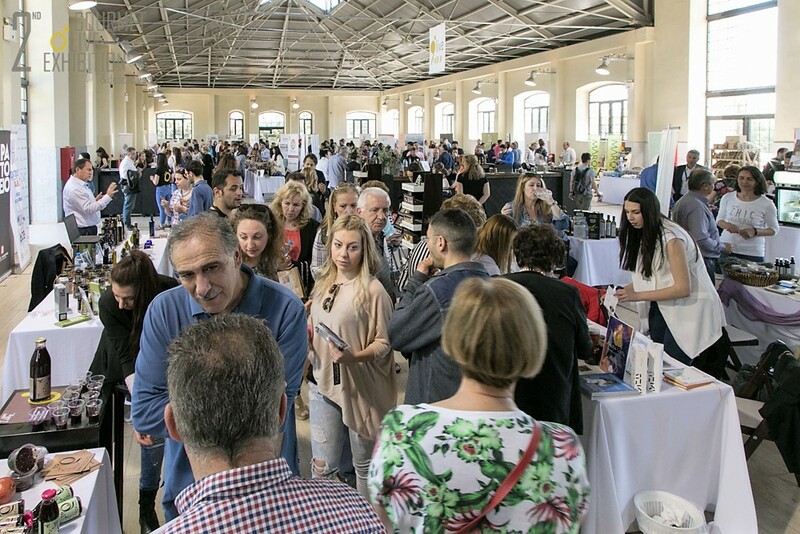 Terraolivo MIOOC is the most important international Olive Oil competition in the area of the eastern Mediterranean and Asia, It is because of the number of samples growing annually and growing production areas, last edition with more than 629 samples from more than 60 production areas. 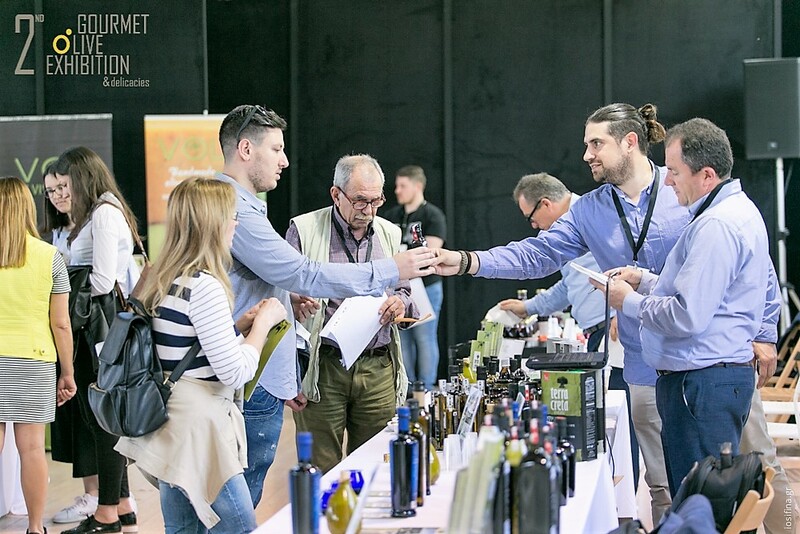 Terraolivo is one of five Key Extra Virgin Olive Oil Competitions in the world where your EVOO can not miss the participation, to try to get the Terraolivo Prestige Awards. 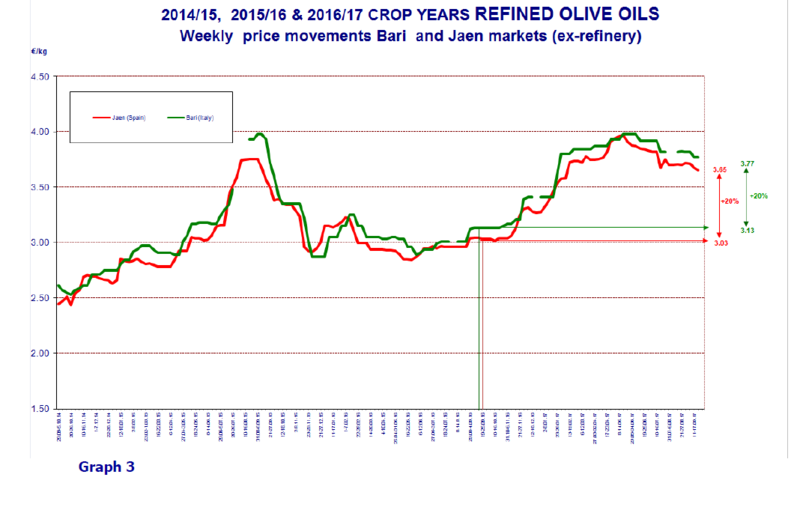 Olive oil prices have risen up to 20% in the past two weeks as output has fallen in the main producing countries. Suppliers such as Cargill, Field Fresh and Borges may raise it further this year, which can hit demand. 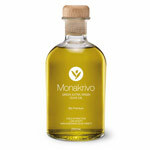 “Olive oil production in key producing nations like Italy, Greece and Tunisia has remained low. 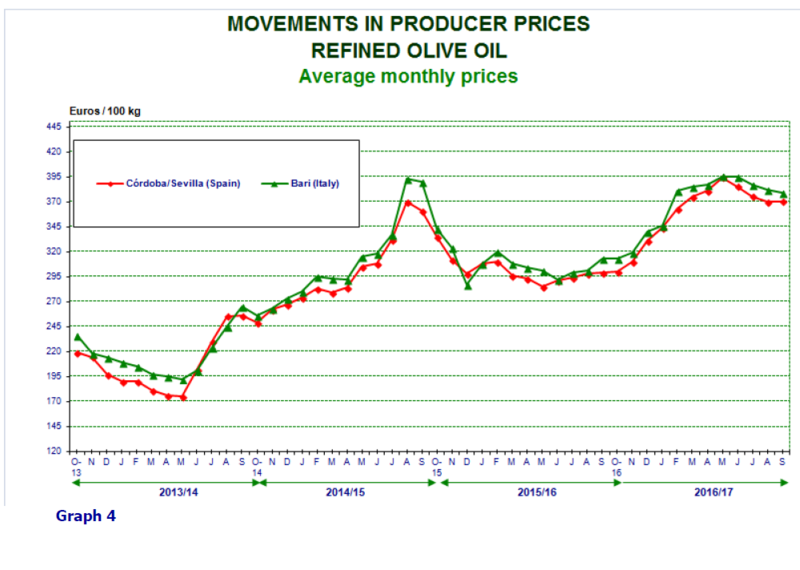 This has led us to correct olive oil prices in retail since the past fortnight by as high as 15% to 20%,” said Rajneesh Bhasin, MD at Borges India. According to him, Italy and Spain contributed 96% of total import of olive oil in the country. Bhasin said the current retail price of pomace oil, which was cheapest in the olive oil category, has seen a 15% increase and is selling at Rs 350-375 a litre, while extra light or refined oil is up 20% at Rs 650 a litre and extra virgin oil is up 15% at Rs 750 a litre.